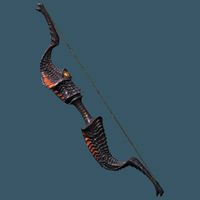 The Edge of Ruin: Find a madwoman's legendary bow. Ruin's Edge previously appeared as a Dark Seducer bow in Shivering Isles. Data suggests a "Burden" effect that slowed the target to 50% speed for 20 seconds may have been intended as an additional effect of the bow. Another unused, and possibly related, effect is called "Reduce Carry Weight", which had the following description: Reduce carrying capacity increases by <mag> for <dur> seconds. Obtained through the Creation Club. This page was last modified on 13 March 2019, at 21:42.